You will also be taught simple procedures to facilitate your progress and help you stay comfortable. Individual sessions usually last 30 to 40 minutes. Appointments: Monday to Friday 9.00 a.m. to 7.00 p.m., and Saturday 9.00 a.m. to 5.00 p.m. Small group sessions may also be arranged. Start with two as an introduction to see if it will suit you. Depending on your needs and the frequency of your sessions, between 10 and 30 sessions would be usual. Usually $90 per 45-minute booking period. Concessions may be arranged. Ask about Health Fund and Workers Compensation Insurance rebates. No. 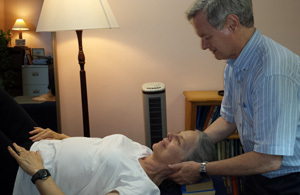 Even though many doctors, physiotherapists and other health practitioners often refer their patients for sessions in the Alexander Technique, you are welcome to make an appointment at any time.